The introduction of a third European competition with the beautiful name Europa League 2 has caused some consternation among the footballing elite. Does Europe really require another European Cup? Furthermore, what about bringing back older competitions like the UEFA Cup Winners’ Cup, which was ended in 1999? Two competitions are surely enough the criticism read stating that clubs have already too many games. 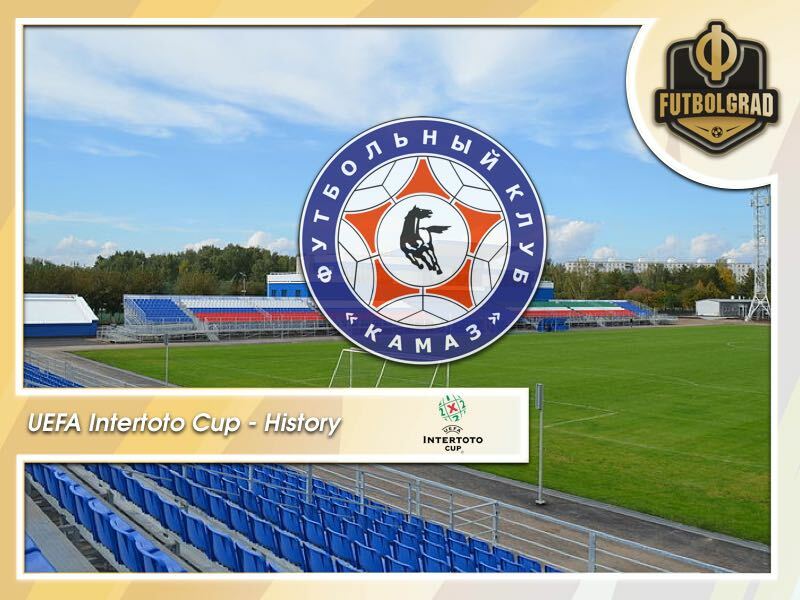 Those voices, however, ignore the fact that until 2008 there was also another competition in the form of the UI-Cup that included glorious names like the Russian side KAMAZ Naberezhnye Chelny. The UEFA Intertoto Cup, to use the full name, was established in 1961. The Intertoto Cup began life as a summer tournament played for the benefit of football pools companies in central Europe. It was conceived by Ernst Thommen, from Switzerland, and the Austrian Karl Rappan, who had dreamed of creating a European league, only to settle for knockout a tournament involving, for the most part, the continent’s lesser lights. Between 1961 and 1995 the tournament was held independently from UEFA and initially had a group stage that led to a knockout round. It was, in fact, the first European club competition with a group stage when the initial International Football Cup kicked off in 1961. Although the tournament was not organised by UEFA, which already hosted the European Champions Cup, Cup Winners’ Cup and later the UEFA Cup, the European football governing body sanctioned the competition – albeit with some reservations. The tournament only included teams that did not play in any official UEFA tournament. The first six winners of the competition were Ajax (1962), Inter Bratislava (1963, 1964), Polonia Bytom (1965), Lokomotiv Leipzig (1966) and Eintracht Frankfurt (1967). By 1967, however, it became increasingly more challenging to organise the tournament as clubs took part in ever more local and international cup competitions. Hence, from 1967 onwards the tournament only included a group stage and had no actual overall winners. Instead, the group winners received cash prices between 10,000 and 15,000 Swiss Francs. Between 1967 and 1995 the competition had between seven and 12 different winners every season. The list of winners included teams like SpVgg Fürth, Carl Zeiss Jena, VÖEST Linz, Čelik Zenica, Widzew Łódź, Maccabi Netanya, Pirin Blagoevgrad and Wismut Aue, Union Berlin – to name a few. The collapse of the Soviet Union and the swelling of UEFA from a small regional football governing body to one of the most powerful football governing bodies in the world with 55 member states meant that competitions and leagues had to be restructured. Hence, in 1995 UEFA took control of the competition and turned it into a qualification route to the UEFA Cup. Initially, two clubs from the UI-Cup were given entry to the UEFA Cup but after Girondins Bordeaux reached the final of the UEFA Cup in 1995/96, where they lost to Bayern München, after winning the UI-Cup UEFA included a third-qualification spot allowing three UI-Cup winners to participate in the UEFA Cup. It was in 1996 that I would come into personal contact with the competition. The year before my club TSV 1860 Munich had finished eighth in the Bundesliga, which qualified them for the UI-Cup. It was a good result for 1860, who were only promoted back to the Bundesliga two years prior after spending 14 years outside the top flight. But at the same time qualification for the UI-Cup was not a major achievement. 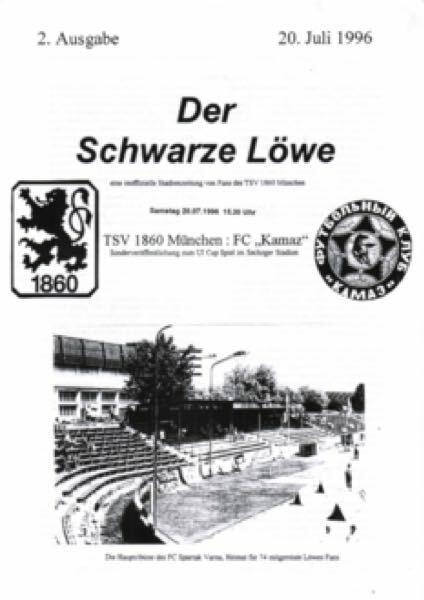 After all, Germany sent four teams to the tournament and with Hansa Rostock refusing to take part, even tenth placed Stuttgart got a slot in the 1996/97 edition. Nonetheless, there was a bit of excitement about 1860 playing in this tournament that I had never heard of before. An enthusiasm that turned into head-scratching when the draw saw 1860 placed in a group with KAMAZ Naberzhnye Chelny (Russia), FC Kaučuk Opava (Czech Republic), Spartak Varna (Bulgaria) and ŁKS Łódź (Poland). No offence neither of those clubs spurned much excitement from a pre-teen youth wanting to see his club play against the likes of Ajax or Juventus. Not that any of the other groups were any better, after all the 1996/97 edition also included glorious names like Rotor Volgograd (Russia), Ataka-Aura Minsk (Belarus), Shakhtar Donetsk (Ukraine), who were by no means known for Brazilians back then, FBK Kaunas (Lithuania), Daugava (Latvia), Narva Trans (Estonia), and Čukraički Stankom (Serbia and Montenegro) – just to name a few of the post-Communist teams involved. In fact, my later obsession with the post-Soviet space and geography must have stemmed from this competition. An avid player of various football manager games at the time I wanted to know where all those clubs came from. My first task was to find out everything there was about 1860’s group stage opponents. That, however, proved to be extremely difficult. In fact, watching the games was a challenge, let alone finding out about the exotic opponents my Lions were going to face in the group stage – dial-up internet would only go so far, not that it mattered teams from Eastern Europe had barely enough money to afford the travel to Munich led alone the resources for homepages. Hence, my club’s opponents were steeped in mystery. First up was ŁKS Łódź visit to the Grünwalder Stadion – another bonus of the competition was that 1860 played their UI-Cups game at their traditional ground rather than the Olympiastadion. Although there is very little record of this game today, I remember this game very well. It was the day Olaf Bodden became one of my favourite all-time football players. A tall blond striker from Kalkar, Bodden would later have to end his career prematurely after he was diagnosed with Infectious mononucleosis and then Chronic fatigue syndrome (CFS) in 1997. Perhaps one of the best forwards to ever play for the club Bodden is now forced into a wheelchair, and the club’s fans regularly collect money to support the former 1860 player. It was that day against Łódź Bodden became my personal legend. The striker was unstoppable scoring four goals in 1860’s 5-0 victory with every single goal being hammered in with thundering headers. Anyhow, I am transgressing. This story is about exotic clubs from the former post-Soviet space and not tall blond legendary 1860 strikers. Following the Łódź thumping 1860 faced KAMAZ Naberezhnye Chelny. Those who have paid attention in Saul Pope’s recent article on the class of 1993 will know that KAMAZ Naberezhnye Chelny were promoted to the Russian Top Division in 1992 and stayed in the league until the end of the 1997 season. In fact, KAMAZ Naberezhnye Chelny were the biggest club from the Republic of Tatarstan until Rubin Kazan were promoted in 2002. Founded in 1981 as part of the KAMAZ truck company the club was able to put together a competitive side in the 1990s. In 1994 the club finished sixth just outside the UEFA Cup places. But Russian clubs did not participate in the 1995/96 UEFA Intertoto Cup. That changed one season later when the Russian Federation entered three sides – aside from KAMAZ, Uralmash and Rotor Volgograd also qualified. KAMAZ had made the cut after finishing ninth in the 1995 Russian Top League standings. Among the players that were in the squad was the 23-year-old goalkeeper Ruslan Nigmatullin. He, however, was transferred from KAMAZ to Spartak Moscow at the beginning of the 1995 Season. Spartak paid 363,345,600 roubles for the rights of the player. How do I know this? It was during the time of researching my PhD dissertation at King’s College in London that I would stumble over the Tatarstan-based club once again. Reading old newspaper clippings in a dusty archive somewhere in London I stumbled over a piece that described how Russian clubs used formulas to determine wages and transfer sums in the 1990s. In 1996, however, I was not aware of the fact that Russia’s national team goalkeeper had once played for this club. The side also included Viktor Panchenko, the club’s most prolific striker in the 1990s, and father of Kirill Panchenko, who nowadays plays for Dinamo Moscow. Not that the name would have meant much to me at the time either. In fairness, he was no longer in the side when 1860 faced KAMAZ in the decisive final group stage match at the Grünwalder Stadion. Both clubs were looking to qualify, KAMAZ had collected seven points from the first three games, and 1860 had six points to their name, only the group stage winners would advance. 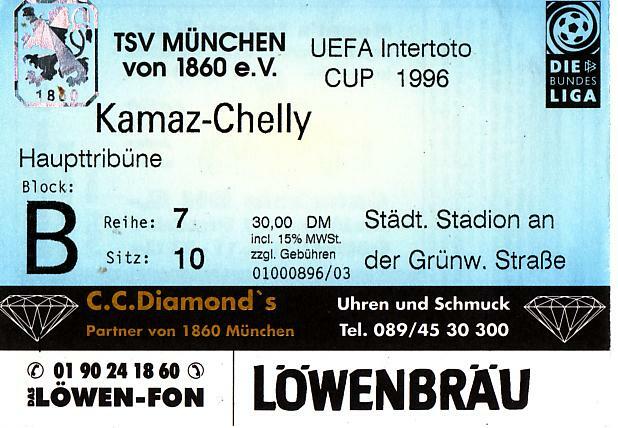 Tickets for 1860 Munich vs KAMAZ. The Russian club name is clearly misspelled. As it is usually the case for 1860 games that matter plenty of fans showed up for the match. The reported attendance that afternoon was 20,500. But what is perhaps the most amusing aspect in retrospect is that the KAMAZ’s club name was misprinted on the tickets. KAMAZ-Chelly the tickets read – again remember this was a time before Google. Whether Google would have helped 1860 head coach Werner Lorant to identify the threat the Russian side possed? Because as it is often the case in 1860’s long, and glorious history, the Lions bottled it. In what was a stale match at times Mikheil Dzhishkariani would score the eventual winner in the 70′ minute. 1860 were eliminated, and KAMAZ were through to the next round. For me personally, this meant that I followed the rest of the competition via the Teletext. Using this now ancient-seeming technology I saw KAMAZ eliminated in the next round by the French side Guingamp. The Russians had won the first leg at home 2-0 but then lost 4-0 in France to be eliminated. I also saw Rotor Volgograd destroy LASK Linz from Austria 7-2 over two legs on the basic Teletext screen. Rotor were then defeated in the final by Guingamp, who together with Karlsruhe and Silkeborg advanced to the UEFA Cup. My club 1860 would participate at the UI-Cup two more times. In 2001 1860 reached the semifinals where they were eliminated by the English club Newcastle United. The next year 1860 faced yet another post-Soviet side in BATE Borisov. The Lions would lose both games and exit the combination on a 5-0 aggregate defeat. And KAMAZ? The Russian side’s participation in the 1996 UEFA Intertoto Cup was the only time the Gruzoviki would take part in an international competition. In 1997 the club was relegated to the Russian First National League and just one season later once more to the Russian Professional League Ural Division. The reason for this was simple. The truck manufacturer KAMAZ started to struggle amidst the Russian financial crisis that hit the country hard in the late 1990s. Furthermore, the Republic of Tatarstan started to focus on another football project by lavishly funding Rubin the club from the capital instead. All of this aided in the club’s decline. Finally, what happened to the UI-Cup? The tournament continued until 2009 but was then abolished and replaced with an extended qualification system for UEFA’s two club competitions. In a sense, the UI-Cup continues live through the early rounds of qualification. It is here that clubs from Western Europe face impossible trips to the European hinterlands. But while those trips continue the UI-Cup will always have a special place in my heard for moments like Bodden’s four goals and the adventures against sides like KAMAZ that in many ways opened my eyes to the wilderness of post-Soviet football.